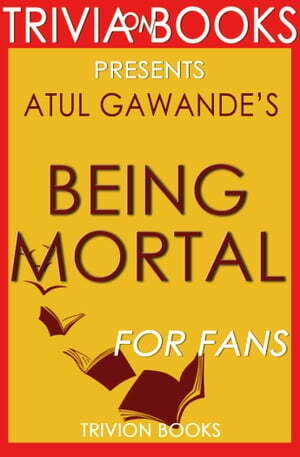 Collins Booksellers - Being Mortal by Atul Gawande (Trivia-On-Books) by Trivion Books, 1230001208979. Buy this book online. It is difficult to deal with a loved one who go through the changes of becoming old. It makes the process even more difficult without the support of medical doctors who understand and can treat an elderly family member. The pain of finding appropriate care for an elderly family member when you are no longer able to help is heartbreaking. In Being Mortal Dr. Atul Gawande discussed these issues as he shares stories and experiences of living with and moving forward when facing the end of life. Trivia-on-Books is an independently curated trivia quiz on the book for readers, students, and fans alike. Whether you're looking for new materials to the book or would like to take the challenge yourself and share it with your friends and family for a time of fun, Trivia-on-Books provides a unique approach to Being Mortal by Atul Gawande that is both insightful and educational!